ustwo wanted a decoupled, REST API-powered website with a React frontend and a WordPress backend. The company wanted a decoupled website with a React front-end built by their own in-house team. Human Made was engaged 6 weeks into a 12 week project to provide a solid back-end CMS with WordPress. This meant a fast turnaround time to get the first version of the website launched. It was Human Made’s responsibility to ensure that data was waste in the structured, reusable format. We used our experience leading WordPress REST API project to build a custom API that was tailored to This client’s needs. This delivered all of the data from ustwo’s custom post types. This structured data is output in a JSON format which makes it usable by any front-end technology. It gave us the opportunity to work with the API in a real-life situation. We found a number of bugs which we were able to fix upstream in the API. In a traditional WordPress project, Human Made is used to build the whole website. 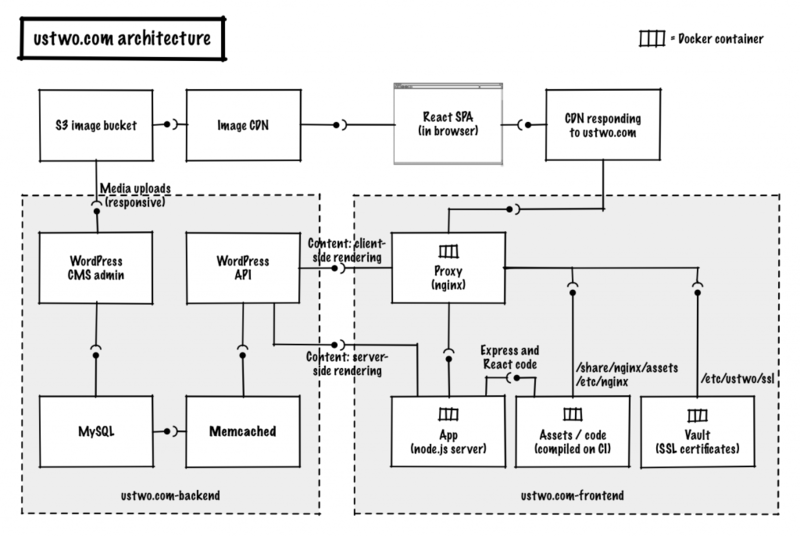 (Front-end and back-end). For ustwo, we were able to focus on WordPress solely as a data collection and delivery method. The wider team, such as the designer, front-end developer, CSS developer, and Node.js developer, were able to focus on their component parts. Ant Miller, Joe Hoyle, Matthew Haines-Young, Ryan McCue.